Over the past several months, Canada’s top banks have placed blocks on their customers’ ability to buy bitcoin and other cryptocurrencies. Some banks have only blocked credit card purchases, but others have blocked debit cards and Interac as well. MyBTC’s high fees will likely discourage frequent traders from using this service as a workaround for banking issues. However, those looking for a convenient way to make bitcoin purchases might find MyBTC to be worth a closer look. Read on for the full details. What Can You Trade on MyBTC? Even though MyBTC has apparently been around for several years, not much concrete information about it is available online. MyBTC’s “Duane S.” is probably Duane Seamans. Seamans’ Facebook profile image matches the LinkedIn profile image. Prior to working at MyBTC, Seamans worked for QuadrigaCX, one of Canada’s largest and most controversial crypto exchanges. The only known executive leader of MyBTC is Duane Seamans. According to Seamans’ LinkedIn bio, he worked in advertising at Publicitas Canada and PointRoll before getting involved in bitcoin in 2014. In that year, he created a bitcoin blog called BuyingBitcoin.ca. That blog landed Seamans a job at QuadrigaCX in 2015. The legal situation around cryptocurrency exchanges in Canada is complicated. In 2014, Parliament passed the Proceeds of Crime (Money Laundering) and Terrorist Financing Act (PCMLTFA). This legislation outlined the licensing and reporting requirements for financial service businesses. The PCMLTFA classifies companies that “handle virtual currency” as regulated money services businesses (MSBs), but the law has yet to go in effect. MyBTC only sells bitcoin and doesn’t support any altcoins. So far, MyBTC has managed to maintain a solid security record. Like many crypto exchanges, MyBTC handles customer service issues primarily via email. MyBTC customers can reach out via [email protected] when they run into technical issues. MyBTC also answers general questions about its services via Twitter and Reddit. CoinDesk, CoinTelegraph and other prominent cryptocurrency blogs haven’t covered MyBTC, likely because it’s one of Canada’s lesser-known exchanges. Only Canadian residents can use MyBTC. There’s no way to purchase bitcoin through MyBTC without a Canadian cell phone. MyBTC advertises the fact that it has low verification requirements. If you have a cellphone and a Canadian phone number, that’s all you need to begin buying bitcoin through the MyBTC site. According to MyBTC’s FAQ page, the exchange does not allow its users to verify themselves using VOIP phone numbers. If the Canadian phone number you try to use isn’t registered with one of Canada’s phone companies, you won’t be able to unlock your account. MyBTC does not have a separate process for on-boarding its business customers. All of its customers have to go through the same verification process and pay the same fees. As mentioned above, MyBTC only supports one cryptocurrency: bitcoin. MyBTC supports Canadian dollar purchases through four different payment methods: Interac eTransfers, debit cards, Interac Online and Flexepin vouchers. MyBTC currently only sells bitcoin. If you want to cash in your bitcoin funds for fiat, you have to make a withdraw and use a different service. MyBTC only offers bitcoin purchases. No advanced trading features are available. 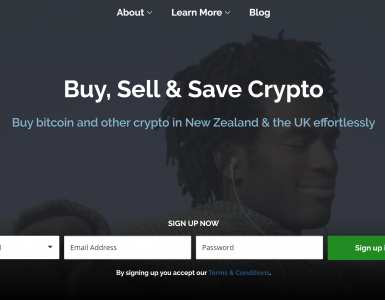 MyBTC’s interface presents its users with four different options for buying bitcoin on its main page. As similar menu can be found in the navigation bar at the top of the page. Clicking one of the four options pulls up the following form. 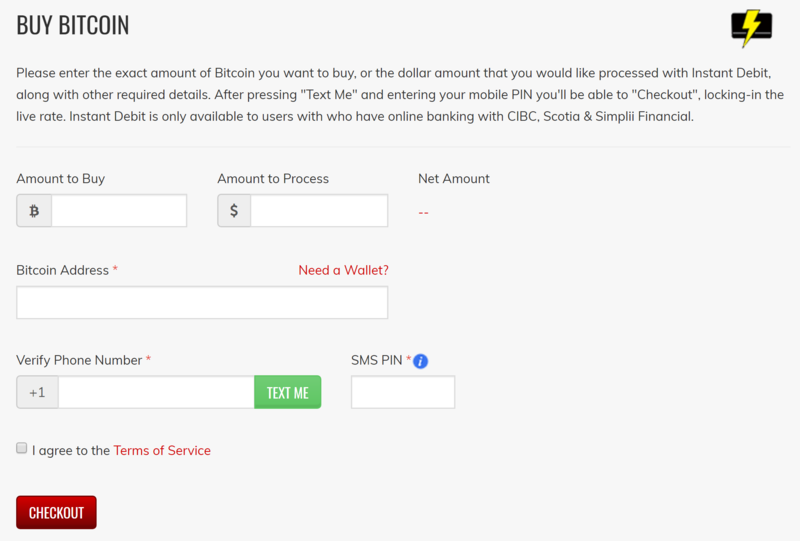 After you type in your bitcoin address and provide the amount of bitcoin you want to buy, you have to verify your identity by typing in a Canadian phone number. After you click the green “Text Me” button, MyBTC will send out a PIN via SMS. MyBTC doesn’t have any official mobile apps. There is an app on iTunes and Android’s app store called MyBTC, but that app is for a totally different business: a telecommunications provider called Bahamas Telecommunications Company. Instant Debit: 7.75% or $20 minimum, whichever is greater. Interac Online: 6.75% or $15 minimum, whichever is greater. Flexepin: 6.75% or $15 minimum, whichever is greater. MyBTC doesn’t charge deposit or withdrawal fees because it doesn’t hold its customers’ funds. After you buy bitcoin thorough MyBTC, the exchange deposits your bitcoin funds directly into your bitcoin wallet. CoinMama, Changelly and ShapeShift are similar to MyBTC. Like MyBTC, all three companies do not provide a hosted wallet services. They also rely on other cryptocurrency exchanges. CoinMama is an American retail bitcoin seller that’s similar to MyBTC. 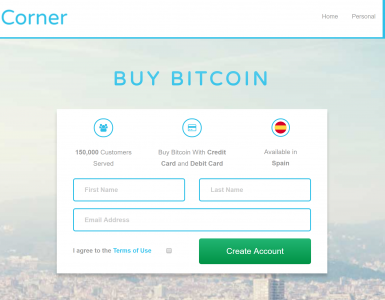 Like MyBTC, CoinMama accepts debit and credit card payments. Both exchanges are designed to be convenient to use and easy for beginners to understand. Another similarity: both exchanges have founders with backgrounds in marketing. On the minus side, CoinMama is even more expensive than MyBTC. The 10.5% standard fee makes MyBTC’s pricey 6.75% fee look reasonable in comparison. 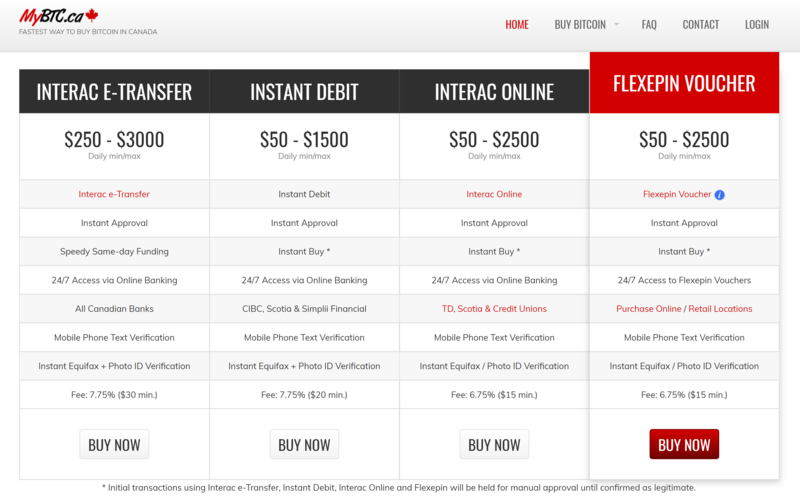 In addition, CoinMama doesn’t accept Interac payments or Flexepin vouchers. Another disadvantage is that like MyBTC, CoinMama only supports one cryptocurrency: bitcoin. 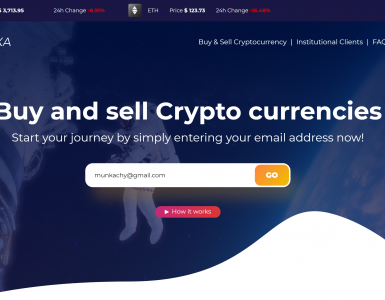 Changelly is another popular beginner-friendly, non-custodial crypto exchange. The main advantage Changelly has over bitcoin CoinMama and MyBTC is that it has a broader menu of altcoins. Changelly’s customers can choose from over 90 different cryptocoins in addition to bitcoin when they make a purchase. The fact that Changelly lets you directly trade one cryptocurrency for another is a another plus. On the other hand, Changelly’s fees are equally as high as CoinMama’s when you use a credit or debit card to make a purchase. The base commission fee is 0.5%. Using a debit or credit card results in a 5% charge that goes to Changelly, and another 5% charge that’s absorbed by Changelly’s card processor. If you already own cryptocurrency funds and want to diversify by buying altcoins, ShapeShift may come in handy. Its main advantage is that it lets you purchase altcoins without going through the trouble of signing up for a full-featured crypto exchange. In many respects, ShapeShift is similar to Changelly, but there is one key difference: there’s no support for fiat whatsoever. In other words, all you can do with ShapeShift is trade one cryptocoin for another. ShapeShift advertises that it doesn’t charge any fees. However, this claim is somewhat misleading because the exchange provides what it calls a “profitable” exchange rate to its customers. This profitable exchange rate typically results in a 0.5% profit for ShapeShift, according to a knowledge base article on the topic. Essentially, MyBTC has one big pro and one big con. On the plus side, it works. You can transfer cash out of your bank account and buy bitcoin. On the minus side, it’s expensive. If you intend to trade bitcoin on a regular basis, MyBTC’s retail fees and largely anonymous corporate leaders will likely encourage you to take your business elsewhere. On the other hand, if you don’t want to go through the hassle of opening an account with a centralized crypto exchange and you only intend to purchase a small amount of bitcoin, MyBTC may be for you. MyBTC’s interface and purchase wizards are intuitive and not hard to figure out. Though the site doesn’t contain any videos or guides, MyBTC’s FAQ is well-written and easy to understand. If you’re a frequent crypto trader and you’re having problems using your Canadian bank to buy crypto, MyBTC presents a possible workaround. MyBTC claims that it works with nearly all Canadian banks. Note: MyBTC reached out to CoinIQ to say that the exchange has recently raised their limits to $5,000 per 24hrs for Interac e-Transfer and Instant Debit.